Fresh on the heels of its $1 million Series A, Triptrotting, a startup that aims to connect travelers with hosts, is relaunching its website with a number of changes. In addition to improved design and functionality, the website also introduces new features which aim to better connect travelers with each other as well as with their local hosts. For a little background, Triptrotting’s focus is to match up travelers with locals at their destination using a fancy algorithm built-in consultation with former eHarmony chief scientist Galen Buckwalter. Local hosts can offer anything from an area tour, to a night out on the town, dinner, or can even offer up accommodation in their own home. Although Triptrotting wants to primarily emphasize cultural exchanges, it does allow hosts to charge for their services, if need be. With the website’s relaunch, the company is rolling out a new feature called “Social Activities,” which allows Triptrotters to find nearby activities by location, date and time. The activities, which now have their own dedicated section on the site, are sorted by popularity, so members can see who’s going ahead of time, and check out those members’ profiles. 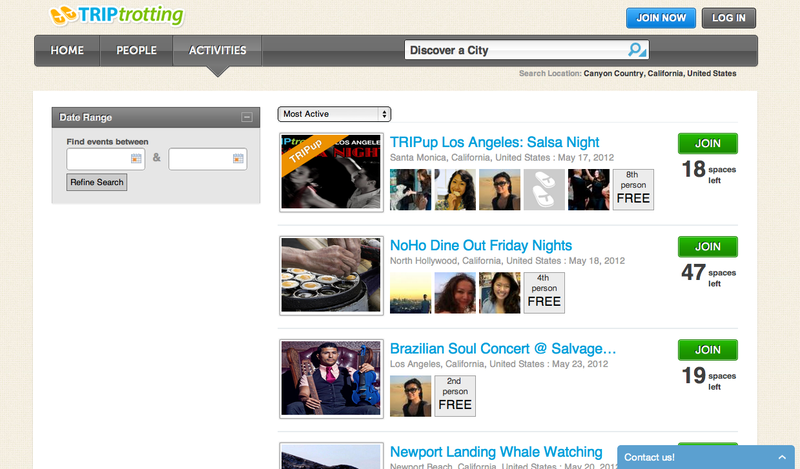 But the suggested activities are also personalized, so you’ll see those that match up with your interests. These activities could include meals, parties, walking tours, concerts, trips to historic sites, museum outings, trips to local destinations or beaches and more. All the activities are curated, but in some cases, Triptrotting is now working with local businesses to highlight their offerings. The activities can also be shared via Facebook, Twitter and Pinterest. 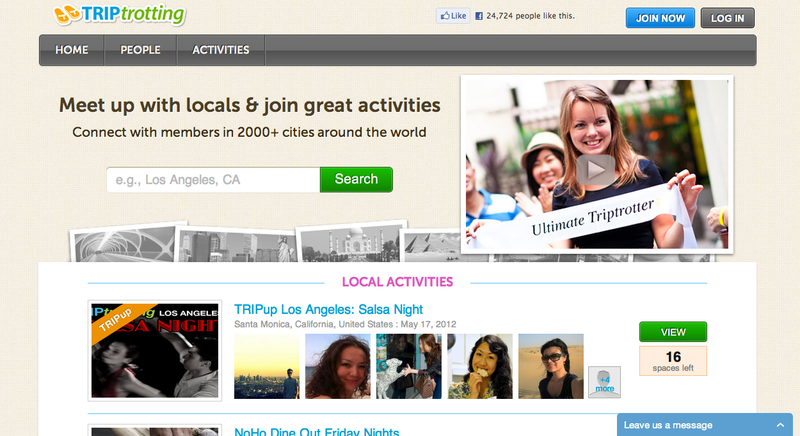 A second notable addition to the revamped website is the TRIPups feature, which are a special type of activity. These are also found in the Activities section of the site, but are noted by a special colored banner indicating they are “TRIPups.” These events are hosted by a select group of Triptrotting local advisors, a group that’s the Triptrotting equivalent of Yelp Elites, perhaps. Already, TRIPups have taken place in China, Brazil, Italy, the U.S., Russia, Cambodia, Hungary, and elsewhere. Previously, however, the events were being organized via Eventbrite. Now, Triptrotting is managing these events on its own site. A more minor update involves enhanced user profiles, which allows members to read and “follow” the profiles of other members more easily than before. Underneath users’ profile photos, for example, there’s a new “follow” button for tracking the members you like. 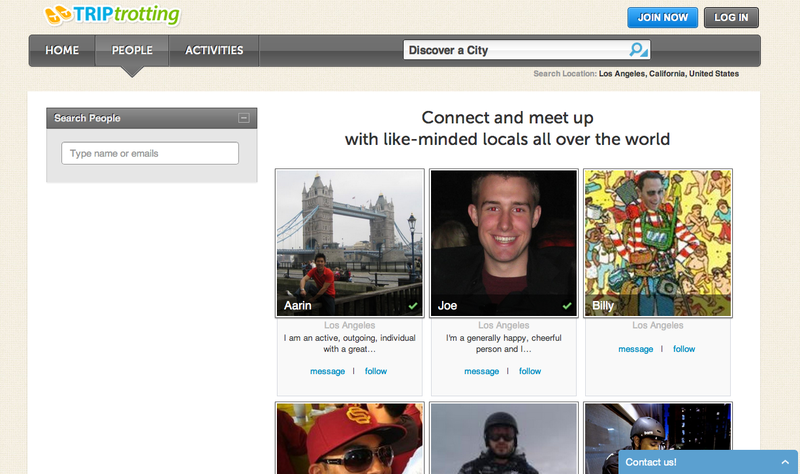 And there’s a new “search” option, too, which lets members find users by name or email. Co-founders Shana Zheng and Aigerim Shorman tell us that all these updates were driven by what the users were already doing and the features they wanted. They also gave us a peek into the demographics, which highlight Triptrotting’s global outlook. Today, the “many tens of thousands” of users are spread out across Asia (30%) Europe (30%), and North America (10%-15%), with the rest in South America and Australia. Live now in 150 countries and 2,000 cities worldwide, it’s good to see a non-U.S. user base on the site, given that it’s aimed at world travelers. The company has several more things in the works, too, including an update that will show you not just the percentage compatibility you have with another user, but why you were matched to them too.